Here we have another new image given to the museum this month and this is one we particularly like. It shows a carnival float, no doubt in a trade class, entered by Merritt Brothers. We don’t have a date but we estimate it to be the 1920s. Here we see a simple and pleasing four wheeled waggon drawn by horse power. There is some decoration with branches and a goodly collection of horseshoes. Let’s take a look at the people. The man on the left is wearing a bandsman’s cap. More than one member of this family was active in the Lavington Prize Band. John Merritt was its leader for 60 or more years. Another bandsman’s cap. The Merritts were rightly proud of the band. Sadly we have no positive names to put to these people. In the background there is another waggon which belonged to the Spencer family at Halstead Farm in Easterton. So we would assume the photo was taken locally but we cannot identify just where. And help with identities would be much appreciated. The old Volunteer Arms was known as ‘The Volley’. It was on Church Street, close to the crossroads. In fact a present day view would still show the bracket that the pub sign used to hang from. We have recently been given a large collection of photos of people and events at this former pub which closed some thirty or so years ago. This one, however, was a record of history about to pass taken by an unknown photographer from the Volley’s porch. Like many a colour print of its era, it has a red hue. Modern technology makes it easy to make changes and our curator reckons the colour rendition below looks better but he emphasises that colour decisions are often subjective and others might disagree with him. The back of this photo is captioned, Mr Reid’s before alteration. Sadly no year is given but we think it is about 1977. The car in the garage is an original ‘C’ registration which dates it to 1965 but it doesn’t look to be in the first flush of youth. 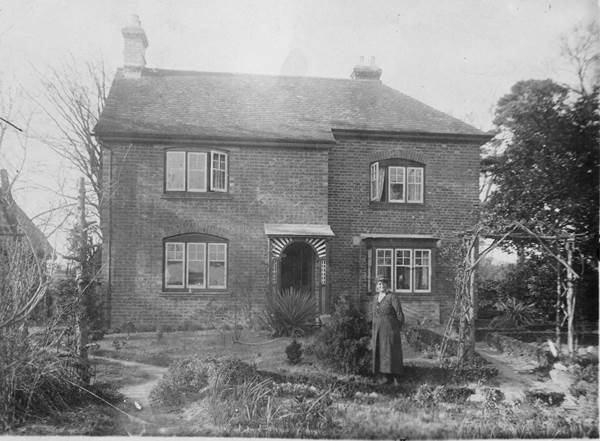 Mr Reid’s house had come to him from his wife’s family. These were the Merritts and photos dating from 1910 show this as a bicycle shop. As time moved on the shop started to serve the needs of motorists and had pumps for petrol. These can be seen clearly in the photo. By this time the building was no longer a shop and the pumps had long been out of use and it was time for them to go. It is good to have the reminder – and in colour as well. This is the same building in the 21st century – clearly after the alterations. The photo we have today, taken well within living memory, may amaze younger readers of this site. 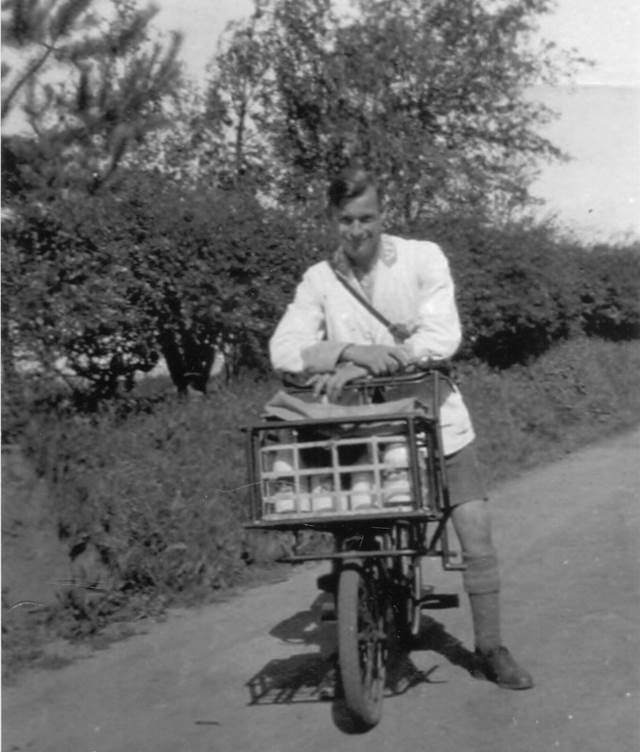 It shows a milk delivery round at Easterton Sands in the 1940s. Vicarage Farm is in Easterton. It is on Vicarage Lane and is more or less opposite the former Vicarage which is now known as Easterton House. It is one of many small farms which once flourished on the sands in both Market Lavington and Easterton. These days they’d be deemed too small to offer a living, but in times past these farms supported families tolerably well. Vicarage Farm was, for much of the twentieth century, owned and farmed by a branch of the Merritt family. Perhaps our best known local Merritt was John who was master of the Market Lavington Prize band for more than 60 years. 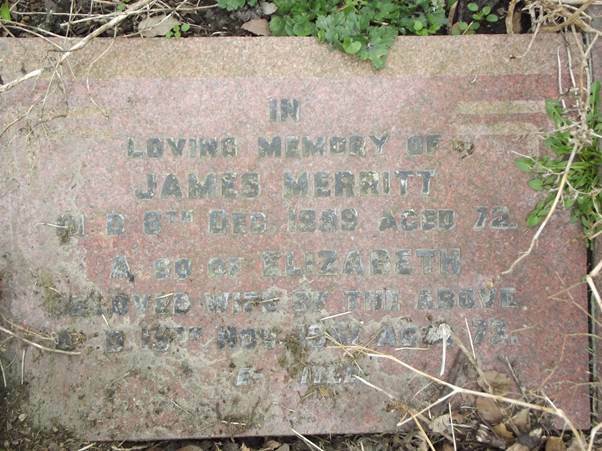 But he had relatives throughout the area, and further afield and one of them, James Merritt acquired Vicarage Farm. Perhaps he took the photo because it is his wife, Elizabeth we see in the photo outside the house. 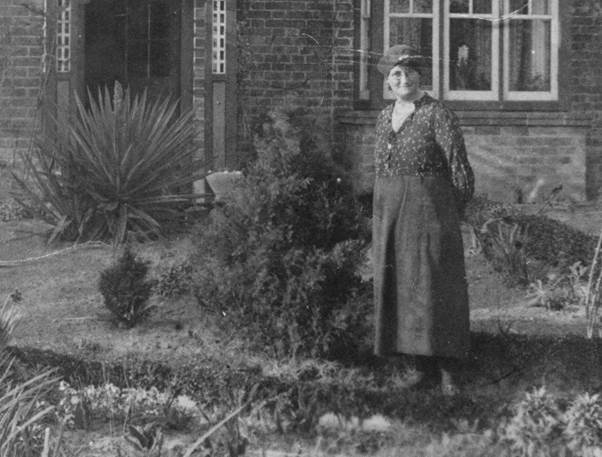 Elizabeth and James married locally in 1910 but Elizabeth (née Fitch) was a Londoner by birth and spent her childhood in the Paddington area. It must have been a real shock to the system when her dad got a job as coachman at Market Lavington Manor and the family moved out to the country. But she settled and the photo suggests she was happy in her lot as a farmer’s wife. James and Elizabeth are buried in Easterton churchyard. 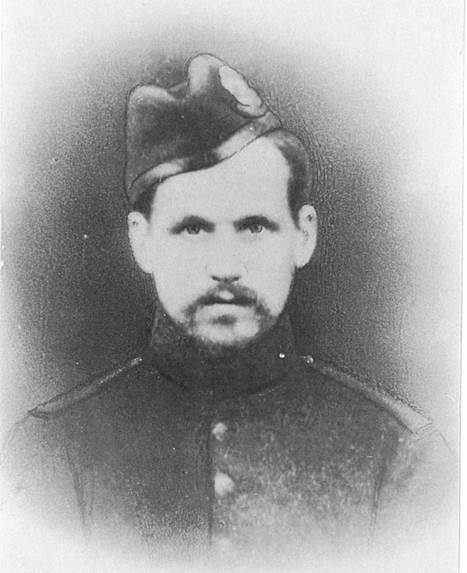 This photo of William Merritt comes as a result of the visit of Peter from Leicestershire the other day but it is, actually, a photo that was held in Market Lavington. It shows William Merritt. So, once again we look into the Merritt family history. William was born in 1850 and was the son of John Hampton Merritt and his wife Mary Ann. John was the blacksmith based at Broadwell. After the 1861 census we lose track of William. Our photo shows a young man in military uniform so perhaps he was overseas. But when we find him on the 1891 census he was married (to a Littleton girl called Elizabeth) and children up to the age of 15 were all shown as born in Market Lavington. That 1891 census shows William as a blacksmith on White Street. It seems likely he had taken over the premises formerly occupied by his father. It is also probable that the census enumerator made a mistake, for William married Emily Jane Lye in 1874. William died in 1892 and is buried in the churchyard at Market Lavington. Emily followed him in 1914.